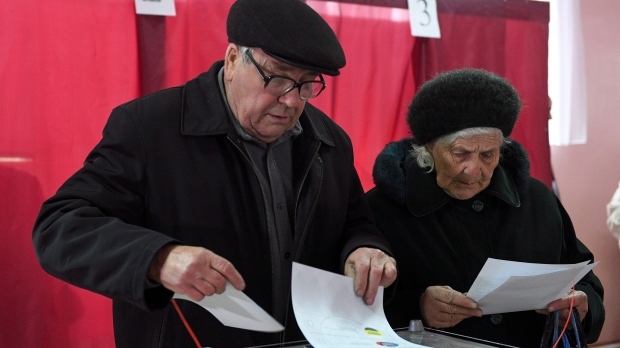 OTTAWA -- The first waves of Canadian election monitors have arrived in Ukraine, as fears rise over Russian meddling in the March 31 presidential ballot. The observer missions are crucial to preserving Ukraine's ability to conduct a democratically sound election in the face of Russian efforts designed to portray the country as poorly run and corrupt. The crisis dates back to the Kremlin's annexation of Ukraine's Crimean Peninsula in 2014 and its backing of Russian separatist militias in eastern Ukraine. Canada and its NATO allies consider Russia's actions, backed by President Vladimir Putin, to be a breach of Europe's borders, and have shored up the 28-country alliance's military forces in several eastern European countries. Now with a pivotal presidential election campaign swinging into high gear, the Trudeau government is following in the footsteps of previous Conservative and Liberal governments in sending a bilateral Canadian-led observer mission, organized between Canada and Ukraine, while also contributing to a multinational mission led by the Organization for Security and Co-Operation in Europe. The OSCE monitoring missions are widely considered the gold standard in international election monitoring. But Canada's decision to send separate observer missions is unique and has generated controversy over the years. Numerous internal government assessments have said the missions were either problematic or too expensive. That has not stopped Liberal and Conservative governments from supporting the missions, sparking concerns that they were simply playing politics to win the support of the estimated 1.3 million Canadians of Ukrainian descent. "Election observation is one of most transparent and accountable ways to support democracy," Adam Austen, spokesman for Foreign Affairs Minister Chrystia Freeland, told The Canadian Press in an email. "That is why Canada is proud to support Ukraine's upcoming elections through a range of actions, including a bilateral election observation mission and the Organization for Security and Co-operation in Europe (OSCE) election observation mission." The last of 58 long-term Canadian observers arrived in Ukraine on Tuesday, officials said. That includes 50 people who are part of the Canadian-led bilateral mission that will eventually include an additional 100 short-term observers. Another eight observers also arrived recently as part of Canada's contribution to the multi-nation mission led by the OSCE. Canada will be sending 14 more short-term observers to that mission in the coming weeks. They are among 100 long-term and 750 short-term observers from 13 countries serving on the OSCE mission. Two proposed Russian observers were rejected by Ukraine and the Kremlin withdrew their request to serve on the mission, said Thomas Rymer, spokesman for the OSCE's Office for Democratic Institutions and Human Rights. "The Ukrainian authorities made it clear that they would not accredit observers from the Russian Federation, and Ukraine's parliament then passed a law supporting this position," Rymer said in an emailed response to questions. "After it became clear that the Ukrainian authorities would not accredit the Russian observers, the Russian Foreign Ministry announced that it had decided not to send the observers, citing security concerns." Canada fully supported that decision to prevent Russians from taking part in the multilateral mission, said a senior Canadian government official, speaking on the condition of anonymity due to the sensitivity of the situation. The head of Ukraine's cyber police told the Associated Press on Wednesday that Russian hackers have stepped up their efforts to penetrate its central election commission computer systems and manipulate information. Last week, the Russian-backed former Ukrainian president, Viktor Yanukovych, claimed there would be vote rigging in the upcoming election. Yanukovych has been found guilty of fuelling the deadly separatist fight that engulfed eastern Ukraine after he was forced to flee the country in February 2014 following a wave of protests. Russia then sent troops to the Crimean Peninsula to annex that part of Ukraine in April 2014. In 2004, former prime minister John Turner led the first such bilateral mission of Canadians to Ukraine under the then Liberal government of Paul Martin. The Conservative government of Stephen Harper contributed Canadians to several more of these bilateral missions. Government officials have raised concerns about this practice. In 2012, Margaret Biggs, the former head of the now defunct Canadian International Development Agency, wrote that multilateral missions are "considered a best practice for international election monitoring." Biggs said that in Ukraine in particular the OSCE is "viewed as the most impartial and trustworthy, and their findings are taken seriously by the host country and the international community." A senior Canadian official said Wednesday that "we think both are important and are doing both."